Kat and Karl : google me! who are these people? google me! who are these people? no news is good news? ENTERTAIN ME! i took the doggies to the vet (they are healthY! and actually behaved!) and had lunch with MK @ scallions! then, i googled myself! 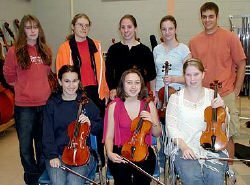 i love googling myself... "Kat Horan" resulted this picture (that's Kat - first one in the back row!) and story! i am an all state musician - in Fulton, New York! Bet you didn't know that about me! Check out the article! apparently I am a Colorado State University soccer player, an African American news anchor in Washington D.C. and a charcter on a New Zealand soap opera. I used to have college softball scores online- now I guess I'm so old they took them off! How depressing!! brooke apker pulls me up twice! once on the utulsa site for the IB program, and once on the boston avenue methodist site for p and i's wedding announcement cause pam and hank are members there. then a few further down there is me for my show in fort worth at carol's work! rock! brooke knight pulls up some graphic designer/artist/professor (i am jealous!) and a dude who is an author. and then a bunch of like stuff about actual Knights. do i win the google game? okay angela wins for randomness. i congratulate her on her achievement. Apparently I currently attend Colorado State University, ASU Jonesboro, and the University of Memphis. Oh yeah, and I died in 1982 in Ohio. After that's it's just a bunch of people named Leah who live in Billings, Montana. I have 10,400,000 hits. My name's fairly common, I suppose. To name a few, I am a psychiatrist who wrote a book called "On Death and Dying," an actress in a 1970s movie, "The Man," someone who makes those seriously crappy banners people hang on their porch for holidays, an artist, and a gifted psychic who wants to help YOU! Apprently I ran the La Pettite Roche Marathon in 1982 and was a Pall Bearer and some guys funeral last year. Actually, that was my Dad because we are both John Robus. I was actually on there twice from college. After that it was all geneology stuff about me immigrating from europe. ok i looked up kristen gloria. it pulled up our surivor blog. how exciting is that? then i looked up kristen jones...2,230,000 results. yeah i wasn't about to look through all of them. so, the few i noticed were singing/guitar playing/piano playing kristen jones, author kristen jones, and oklahoma state student kristen jones. Carol Thomas pulled first pulled up Joyce Carol Thomas and here I am a childrens book author who lives in Berkeley, California. Then I clicked on the second link and here I am some type of black musician(wow I changed colors). Oh and didn't you know I am the leading expert in the field of urban planning. OOOO and I am a doctor, wow who da thunk! By just looking up Carol Thomas, I don't think you could find ME if you wanted to. HAHAHAHA!!!! Well, first Susan Mulhearn is a 41 year old red-head who lives in a trailer park in Florida. There's a whole fictional story all about her in the St. Petersburg Times. When I typed in Susan Day, I did find one that was actually me. 2002 Fall Graduates of UCA! Oh, and Seth and my wedding annoucement in the Democrat-Gazette. Fun! So....with Leslie Robus, I got 7 hits (no surprise there as robus isn't that common). $ of these hits were actually me and the others weren't too exciting. But with Lesile Reynolds (maiden name of course) I am a stage hypnotist, an owner of a company charged wtih tax fraud, a revernd in Utah, and the author of Mormons in Transition. Oh the entertainment we all got from this. What a great idea KAT!!! I didn't know I marreid a mormon. You don't secretly have like 8 other husbands do you?